FANBOY PLANET.com . 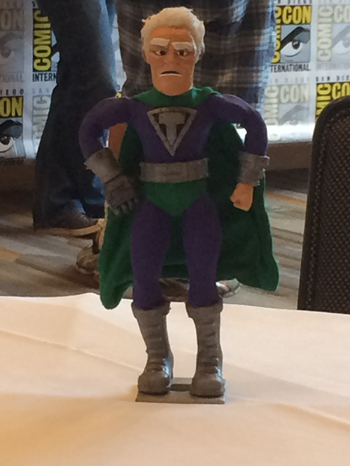 : 2015-comic-con-SuperMansion :. UPDATED 08/12/15: Hey! Here's a link to the actual site to watch it! 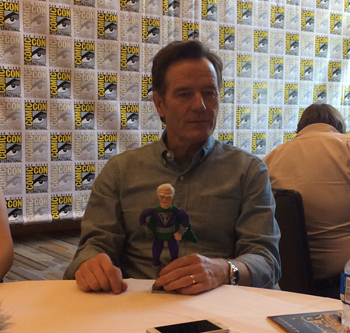 Created by Zeb Wells and Matt Senreich from Robot Chicken, the series got a major boost when Bryan Cranston not only agreed to voice the lead, but also come onboard as a producer. Now whether or not that opened the door to the flood of high-profile talent also working on this stop-motion puppet superhero comedy, who knows? He is the one who knocks, after all. Actors like Chris Pine, Ron Perlman, Famke Janssen and Anton Yelchin have all come onboard for guest shots. And the regulars are a pretty amazing bunch, too. Of course Seth Green is onboard, also executive producing. Keegan Michael Key and Jillian Bell will also be on week to week. Feeling like a combination of The Last Days of the JSA and Kingdom Come combined with every seven or eight years of The Avengers comics, SuperMansion follows the adventures of Titanium Rex (voiced by Cranston, who’s also the series’ executive producer) as he struggles to live with and fight alongside the Millennial-aged, often lackadaisical members of The League of Freedom. There's no question that comics writer Wells knows this cold. The main character breakdown is as follows. Powers: Wings for flight, an eagle eye for spotting trouble and a beacon of the American Dream. He's also skilled in traditional soldiery combat and peeling potatoes. Though the joke may die fast, I find it hilarious that their main arch-enemy is an evil prop comic.